Today’s Triumph motorcycle range has several models committed to their heritage, keeping that vintage look alive with modern classics. You see that quaint, Second World War-era motorcycle patched together, struggling to keep up on the highway. It’s from Triumph motorcycles, complete with exhaust patchwork from a coffee can, a ripped seat, rusty tank, and barely holding together at the seams. It sounds as rough as it looks, but it’s still puttering along. This is NOT the Triumph motorcycles we’re talking about, but it provides a glimpse into the type of bike you’ll get today. No, not the rust and weak-sauce repairs. The classic style and the longevity to stay in service for more than half a century. Today’s Triumph motorcycle range has several models committed to their heritage, keeping that vintage look alive with modern classics. 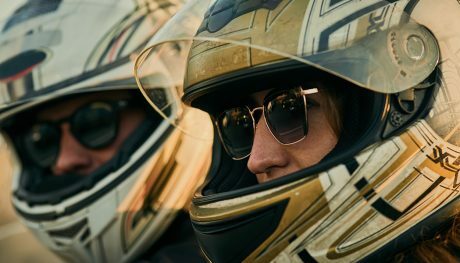 But there’s more to Triumph than bikes that look old – you’ll find unique two-wheeled masterpieces from the British bike-builder that span a range of styles. Who knows, you might see something that revs you up. 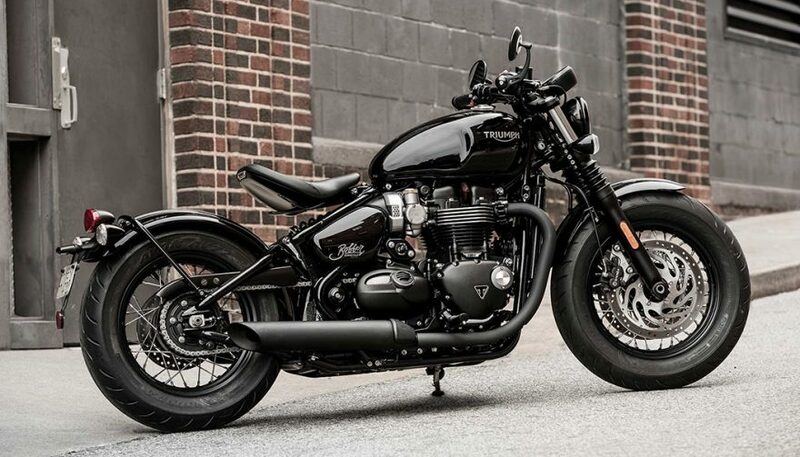 That custom bobber look – minimalist, shortened rear fender, and suspended single seat – is available off the showroom floor with the Triumph Bonneville Bobber. It looks awesomely retro but trust me, it’s about as modern as you’ll ever want in a Bobber. Fat rubber, a trimmed-up rear fender, classic fuel tank with knee molds, and wire wheels hold tradition dear, as does the floating seat. 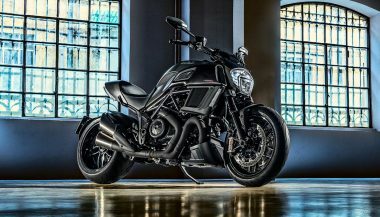 But here are some cool modern things: the seat has height adjustment, the fuel-injected 1200cc engine has 77hp, lighting can be all-LED, and it has two driving modes, ABS, and traction control. The added bonus? This Bobber wasn’t welded together all willy-nilly in a British back alley. It’s the crux of what Triumph is known for: modern classics. 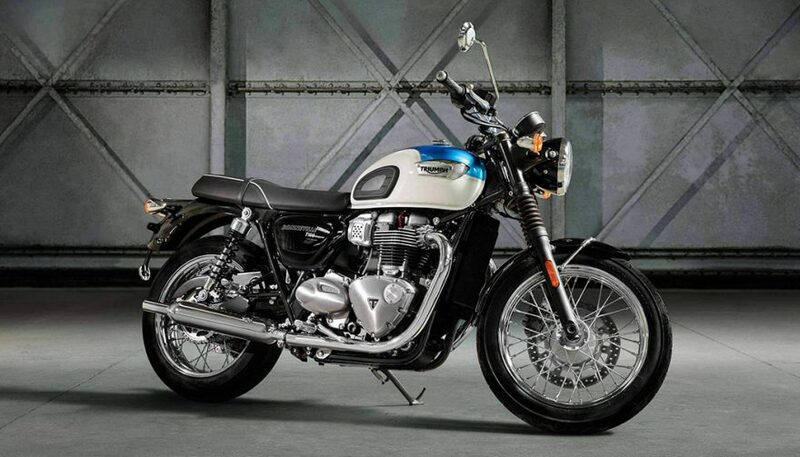 The Triumph Bonneville T100 is styled after the ’59 Triumph Bonneville, but better in pretty much every way. 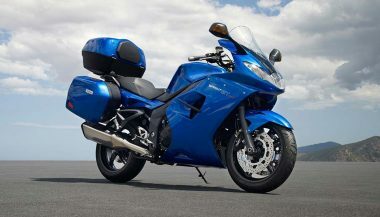 You still get the sculpted Triumph fuel tank, wire-spoke wheels, and the flat-style two-up seat that’s era-appropriate. Even the mirrors on gangly stalks and the round bare headlight are classic notes. 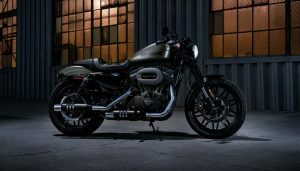 But modern twists include a liquid-cooled 900cc parallel-twin engine with 55hp, electronic fuel injection, an LCD display, ABS, traction control, and an LED rear light. We know that adventure bikes seldom see off-road conditions but buyers want to know it’s possible. 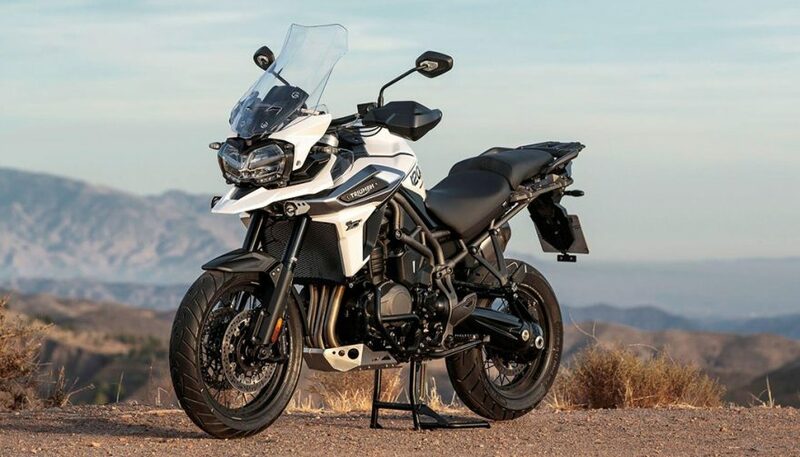 With the Triumph Tiger 1200, you’re getting a bike that can handle itself in both situations very comfortably. For durability, it’s a shaft drive system that transfers power from the 139-hp triple to the rear tire. 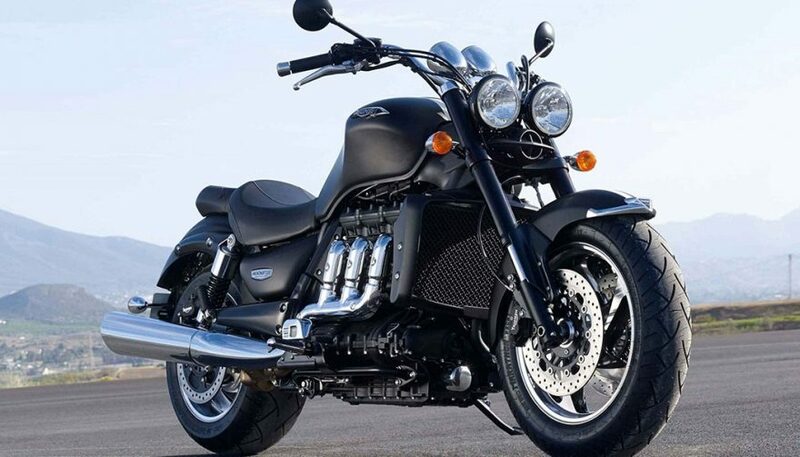 It’s the only Triumph motorcycle with a high windshield, keeping locusts and mosquitoes out of your dental work. It has a very upright seating position with two adjustable height settings, ABS and traction control, four riding modes, and skid plates. A couple upper trim levels also offer heated grips, LED adaptive lighting, and a few other premium options. Fast bikes weren’t really their thing until recently, and then they most definitely were. The Triumph Speed Triple S is a high-performance model that combines aspects of a naked bike, an adventure cruiser, and a track-ready racer. Stripped away to show a powder-coated frame and the triple-cylinder engine, the minimalist fairings look almost out of place, but that’s the British quirkiness we expect from Triumph motorcycles. Its forward, nosedive stance looks racy enough, and the bike has the balls to back it up. 148 horsepower and 86 b.-ft. of torque from a 1050cc triple, fully-adjustable shocks, Brembo brakes, and four selectable riding modes give it power and control you’ll fall in love with. And for the millennial riders, a 5-inch TFT screen and a USB port are standard equipment. Built on the back of the Bonneville style, the Triumph Street Scrambler is more intended for freedom-seekers; those who don’t belong on the straight and narrow. It takes the Bonneville’s clean lines, minimalist design, classic finishes and bastardizes them. That’s a good thing though. Check out the exhaust running high up under the rider’s thigh instead of skimming the pavement. Riding position feels upright and old-school but makes adventure-style riding easy. 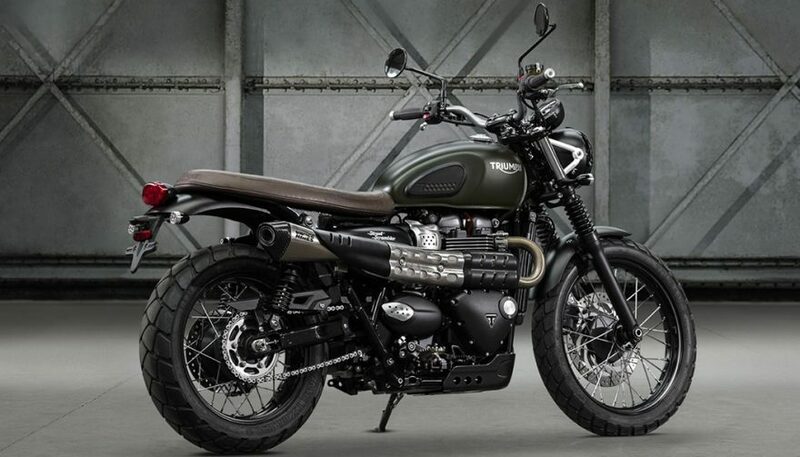 The Triumph Street Scrambler is highly customizable with 150 accessories available including aluminum rear racks, removable pillion seat, and more. Classic café racers are all the rage right now. 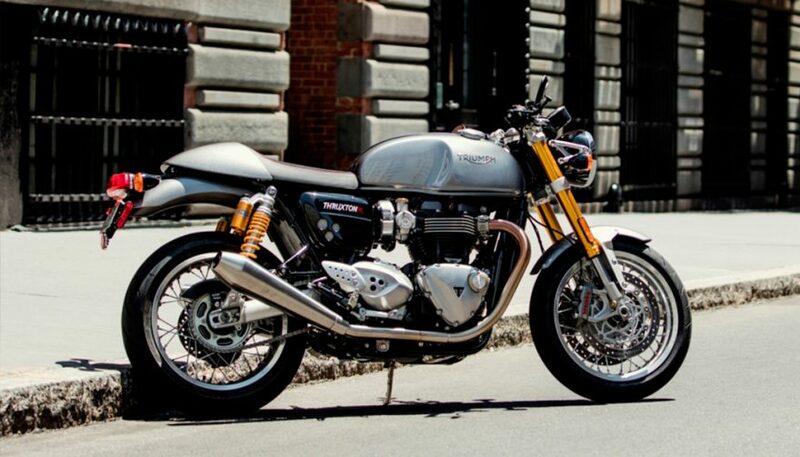 Triumph has arguably the best one right now with the Thruxton 1200. Super-sleek lines, a low riding position, molded fuel tank, and a nearly vertical rake – it all adds up to a classic look with modern vigor underneath. There’s a more laid-back style of Bonneville out there in the Triumph Motorcycles lineup. 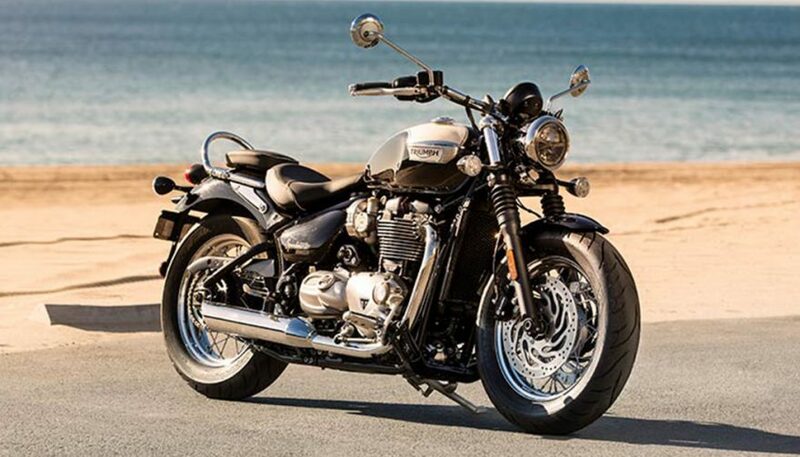 It’s called the Bonneville Speedmaster, although its name isn’t really indicative of its nature. The Triumph Bonneville Speedmaster employs the versatile 1200cc engine but tuned down to 77hp. It has a wider feel than other Bonnevilles, probably because of the beach bars, the forward-mounted foot pegs, and its relatively low seat position. 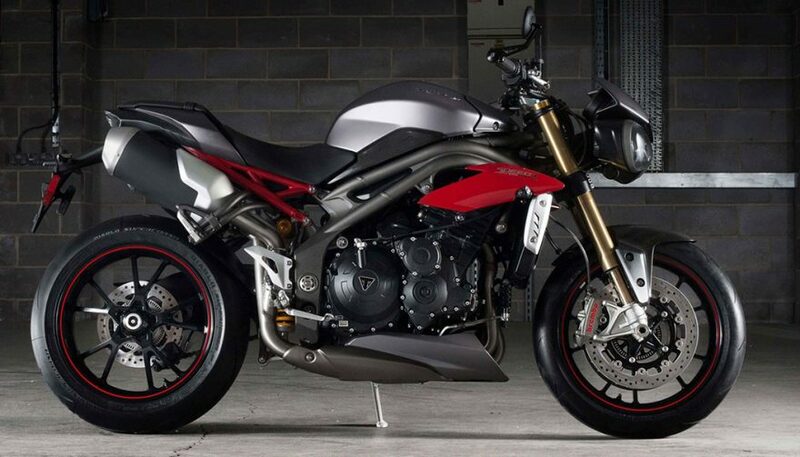 It’s one of the best Triumph motorcycles for doubling though. Modern retro looks are still the thing with the Bonneville Speedmaster. Brilliant retro paint schemes with flashes of chrome all over draw your attention, while modern touches like LED lighting, ABS, and cruise control make it much more rideable for long distances. With a name like ‘Rocket III’, there are big expectations. It’s strange it’s a bike in the ‘cruiser’ segment. So how does it hold up? Let’s start with the looks. A unique dual-headlight design, medium-size windshield, and a cruiser styling don’t lend itself to the ‘Rocket’ moniker, so it’s starting out at a deficit. 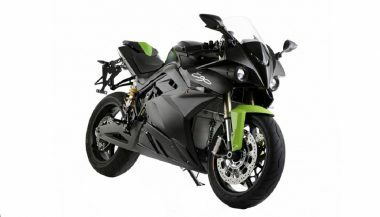 But its massive, sculpted fuel tank, triple chrome headers, and matte or gloss black paint scheme balance it out. Those chrome headers are more than style cues. They exhaust the Rocket III’s massive 2.3-liter, three-cylinder engine as it pushes out 148hp and an incredible 163 lb.-ft. of torque. You’ll break the shaft-driven rear tire loose in almost every gear. It’s a style that only the British would think works for a high-powered bike. And yes, it holds its own.